So how do we get you our sequences and where is the online store? You're at the online store now. And you get your sequence(s) at FTDNA, 23andMe or AncestryDNA. Which one is the best in your opinion? At the moment FTDNA, as far as the raw data is concerned. Is Genographyc 2 data usable? Ancestry and 23andme are both awful. Ftdna is the only way to go. How accurate are your results? Are you actually French and British?
" However, in the 1600’s, the Cranes of Suffolk moved to Massachusetts & Connecticut and were Puritans." Oh, Sweet. The impression from history class is all 17th century Americans were Puritans. But I never got an explanation for what happened to them. I imagine their community disappeared but the people didn't. I also have ancestors who were Puritans. I assume we would email you the FT or Ancestry DNA files? Lots of requests came in over night. I'll get onto them shortly. @David, what about the aDNA IBD offer? Does that include all the new samples on the PC plot? Well, Benjamin Crane my 9th Great Grandfather ( wife Mary Backus) had a Tannery in Wethersfield, Ct. in mid/late 1600’s. His descendants moved to South Putnam, NY. in the early 1700’s. Dr Joseph Crane, Jr my 6th Great Grandfather(wife Esther Belden) was a doctor in NYC during the Revolutionary War. His descendants moved to Western New York from South Putnam. My Great Grandfather Charles Fredrick Crane(father John Crane, mother Betsy Wakefield) moved to Iowa then California. ( wife Lucy Battle) My Great Grandfather OB Crane moved from California and back to Jones Co. Iowa. Married Susie Allen born to German ( Hein)& Swiss (Allen) immigrates (1850’s) to Jones Co. Iowa. My Grandmother was Anita Crane Fox born in Iowa 1911. Her MtDNA is H6a1a2b1. I’m a Greenfield & Niehaus(MtDNA K2) from my father’s side. A Fox & Crane from my mother’s side. I enjoy researching my recent Surnames/lineages too! Traced my maternal ggg Grandmother Anna Barbara Schoner Hein to Ansbach, Germany. My paternal Grandmother, Esther Niehaus Greenfield’s maternal line was from Venne, Germany. Ancestral DNA tests: what should I know before I start? Can you work with data from LivingDNA? The samples in the upcoming IBD run will be exactly the same as in the previous run. I'll have to decline your invite to read Eupedia. Lief's too short. Yes, I can use LivingDNA data. This percentage makes sense with the study of Leicester in my region, study based on the Y haplogroups. Our percentage of germanic ancestry is probably very similar. I think you could and should charge more for this... at least $20? Your time is valuable. As I understand you need the raw data from FTDNA. Do you prefer build36 or build37? Hey, another Iowan.. Sioux City area here. Interesting. Do all Normans show German and British influence? In Normandy from area to area, the ratio Celtic/Nordico-Germanic must be different, more Nordico-germanic on the coasts than in the south or inside of the country, more Gaulish. In Cotentin and " Pays de Caux", the number of place names of Nordic origin ( Scandinavian and AS) is very high, but absent in much of the country. Unfortunately, as Normans we are not legion in the databases. Two examples, on Anthrogenica, we are often talking about a Norman lady from Cotentin, very very English. Seems like only people with FTDNA files are now sending through their data. Please note that I can run AncestryDNA, FTDNA, 23andMe, and LivingDNA files. I found some Schoenherr’s in Sioux City. Just found out a couple of days ago the CORRECT spelling of my maternal 3rd Great Grandmother’s maiden name: Schoenherr and from Ansbach, Germany. I prepared a heat map of averaged scores. Most of the variance is concentrated on dimensions PC1-PC4. 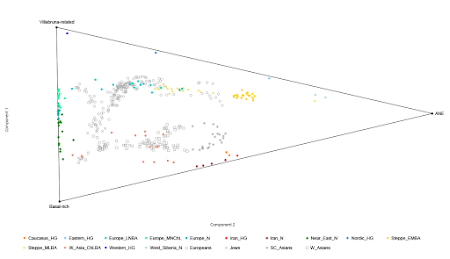 N_Europe PC1 vs Global10 PC4: PC1 is the main PCA in N Europe, splitting Baltic from NW Europe, and PC4 in Global 10 roughly measures HG ancestry and distinguishes Europeans from Near Eastern populations. Generally these correlate, however there are differences in correlation from Eastern Europe and populations ancestral to present day Eastern Europe including Scythians, Samartians, Hungary_BA, Hungary_IA and Slav_Bohemia, against others. N_Europe PC2 vs Global10 PC6: PC2 is the secondary PCA in N Europe, splitting Volga-Ural from Baltic-Slavic populations, while PC6 in Global10 is the East-West split in West Eurasia. There's not a lot of correlation between these two. The Slavic populations seem to fit best in these 10+Global10 together as mostly derived from the I1502 (BR1) Hungary_BA sample, with the remainder 50-40% being about 20-10% late steppe (Poltavka or Samaritan/Scythian) and either Slav_Bohemia or Bell Beaker Germany. Possibly this could be a real signal that these populations derive ancestry from individuals like I1502 together with late Bronze-Age to early Iron-Age Volga-Ural Steppe groups...? Nice heat map. Can you post the R script? Off topic. Maybe WHG originated in Ice age Italy. DNA from the Iberian Refugium decended Magdalenians don't look like WHG's main ancestor. "The Slavic populations seem to fit best in these 10+Global10 together as mostly derived from the I1502 (BR1) Hungary_BA sample, with the remainder 50-40% being about 20-10% late steppe (Poltavka or Samaritan/Scythian) and either Slav_Bohemia or Bell Beaker Germany." On a related note, it's still an open question where these BR1-like people exactly came from... They're not like typical Yamnaya steppe-folks, with their strong WHG and their lack of CHG. And although BR1 is often used as a representative of early Bronze Age Hungary altogether, there were also many less extreme people in EBA Hungary; if you check the PCA in Mathieson et al., it can be noted that most Vatya individuals are not far from the Bronze Age Balkan samples. There is just one HG rich Vatya outlier which is close to BR1 in that PCA; that's RISE479, I suppose. Whether BR1 is more typical for the Mako culture is an open question, as there's only one of them. Someone suggested GB1 from Chalcolithic Romania (Gonzalez-Fortes et al.) looks similar to BR1. And I definitely don't think it's the best idea to merge BR1 and BR2 to a Bronze Age Hungary average. They were 900 years apart and from different cultures, and from what I've gathered BR2 isn't very north European-like either, he has relatively low Steppe ancestry. BR2 may be related to the Protovillanovans in Italy, as he belongs to the eastern Urnfield culture. I hadn't been following the Tollensee samples too closely yet (because of the limitations) but w.r.t the BA Hungary samples, they seem like a mix of south-central European MNE (Baden, Remedello, Iberia Chalc.) & a yet difficult to define north/ eastern mix (? epi-Corded Ware E.C.E, giving a high "Latvia HG" signal). 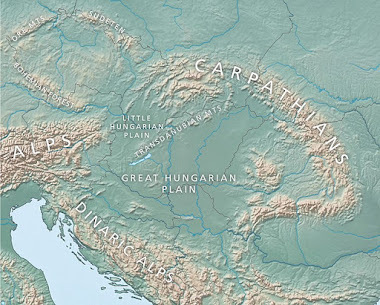 On the other hand, the Y lineage often encountered in BA Hungary is W-C European, an I2a2 distinct to, both, GAC and Carpatho-Pontic Chalc - Yamnaya type. @Arza, that's a pretty interesting prediction, and on the basis of geography it seems fairly plausible, hope we can get the samples from Trzcinienc / East Trzciniec to test it and see what happens. When I first had you analyze my DNA data I only had 23andMe results. I have since had Ancestry.com analysis done. Do you think it would be worth my while to send those to you for further analysis? Do you think it would add anything significant? Nope, unless I run you in a test that you haven't done before. I believe you have done them all so far. I'll hold out until you come up with a new test and then I'll send them both in. @ Rob, thanks for the response by the way, I think that "epi-Corded Ware E.C.E, giving a high "Latvia HG" signal" could be a very viable idea (based on the lack of any particularly HG other groups in Hungary, Balkans, GAC, that we've sampled so far). Re: specific W-C European I2a2, pointing to the Hungary_BA samples having a specific W-C MN link, I'm leerier of ideas that are less geographically simple on very specific subclades, just because of population structure and unsampled populations in y-haplogroups. But you may well be right, and there may be enough samples that its reasonable to make the conjecture, and I don't have a very good grasp of y-tree for ancients at the fine detail, esp. with so many more samples out there. Yes still hypothetical but it was based on the stratigraphy of samples from ancient Hungary, not modern data, and we have a reasonable number of the former to date (although still patiently waiting for the release of Lipson, Mathieson and Olalde for further detailed analysis). he has less Steppe_EBA than Bergamo, but more WHG than Belarusians. @Simon, I must actually admit that I had forgotten that it was Vatya:RISE479 and BR1 that were the Hungarian "outliers" and not BR2 and BR1. BR2 is J2a1 (Y) and K1a1 (mtDNA). Dates c. 1200 BC, i.e. at the cups of the 'Bronze Age collapse'. His extra CHG could be from Balkans and/ or directly from Caucasus. @Rob, that's a good point. Would not be surprised at all if Hungary in the Bronze Age was experiencing gene flow with both Balkans as well as other regions in Eastern Europe (and potentially in Western Europe given your earlier comment re:the potential kind of MN found in Hungary BA samples). https://www.biorxiv.org/content/early/2017/11/06/167551, updated with a bunch more adna tests. 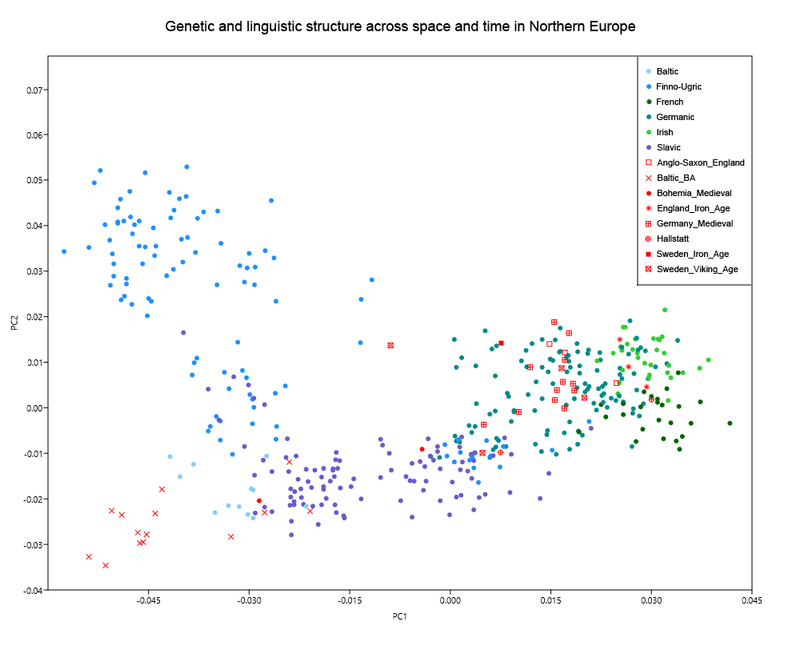 1) Genetic height differences between present day Europeans quantified put pan-Northern Europeans (e.g. English in west to Ukrainian and Lithuanian in the east) at about 179-181cm (5 foot 11), mostly without much correlation with longitude, Bulgarians and Spanish at 178cm (5 foot 10), Sardinians and Southern Italians at 176cm (5 foot 9). East Asians are placed at around 168cm (5 foot 6), and the South Asian 1000 Genomes GIH at 174cm (5 foot 8.5). 2) Among ancients, STP seem to have the same score as modern day British and CEU, so about 179-181cm for Yamnaya, while EEF are exactly a third of the way between the predicted East Asians and GBR/CEU in polygenic height, and slightly above GIH, so should be (genetically) 176cm as well (5 foot 9). Central European Bronze Age are intermediate STP and EEF and seem slightly shorter than present day people with similar ancestry proportions so selection may have operated slightly in most European post-Bronze Age populations to some extent since then, to increase robusticity or height. 3) Strangely, CHG seem tall (just above 180cm) and EHG seem shorter (the same 176cm range as EEF) in their analysis, and STP are accordingly intermediate. Not necessarily what I would've been expected, but Allen's Rule may have been at play in adapting EHG to be short, sturdy and robust compared to taller and proportionately slimmer WHG / CHG or Anatolians of the same height and more generally gracile proportions, all perhaps evolving in more temperate regions. Anyway, seems like trading a bit of CHG for EEF or EHG might make some populations slightly taller than expected? Where are these estimates in the paper? @Davidski: Apologies, thought this would be self explanatory from my linked imgur gallery so forgot to actually state it! 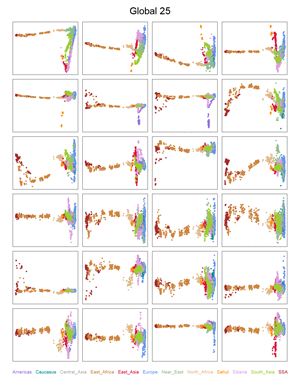 Figure S12 provides polygenic scores "placed on phenotypic scale" (so converted to actual heights), so that's valid for the modern populations and where the cm differences I mentioned come in. Figure 4A provides differences between ancient West Eurasians and modern European, East Asian and South Asian populations. It expresses these differences in terms of Polygenic Height Scores, but since there are overlapping modern populations (CEU, IBS, GIH, etc.) between the "phenotypic scale" Figure S12 and Figure 4, it's easy to convert ancients on to the phenotypic scale. >Widely considered as one of the cradles of human civilization, Mesopotamia is largely situated in the Republic of Iraq, which is also the birthplace of the Sumerian, Akkadian, Assyrian and Babylonian civilizations. These lands were subsequently ruled by the Persians, Greeks, Romans, Arabs, Mongolians, Ottomans and finally British prior to the independence. As a direct consequence of this rich history, the contemporary Iraqi population comprises a true mosaic of different ethnicities, which includes Arabs, Kurds, Turkmens, Assyrians, and Yazidis among others. As such, the genetics of the contemporary Iraqi populations are of anthropological and forensic interest. In an effort to contribute to a better understanding of the genetic basis of this ethnic diversity, a total of 500 samples were collected from Northern Iraqi volunteers belonging to five major ethnic groups, namely: Arabs (n = 102), Kurds (n = 104), Turkmens (n = 102), Yazidis (n = 106) and Syriacs (n = 86). 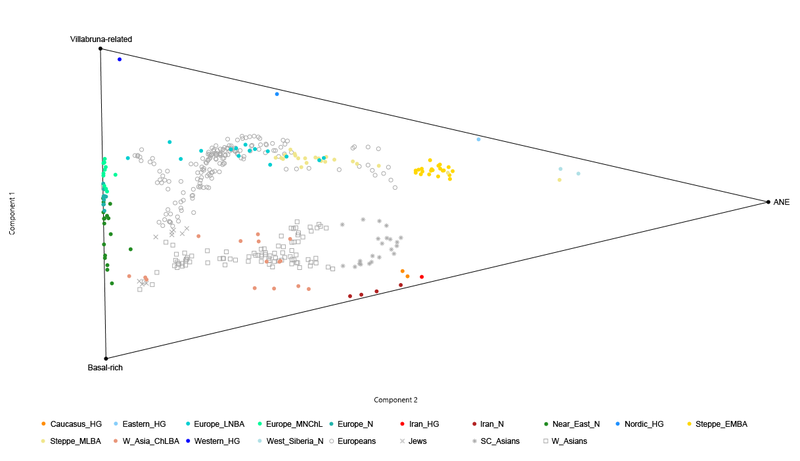 17-loci Y-STR analyses were carried out using the AmpFlSTR Yfiler system, and subsequently in silico haplogroup assignments were made to gain insights from a molecular anthropology perspective. Systematic comparisons of the paternal lineages of these five Northern Iraqi ethnic groups, not only among themselves but also in the context of the larger genetic landscape of the Near East and beyond, were then made through the use of two different genetic distance metric measures and the associated data visualization methods. Taken together, results from the current study suggested the presence of intricate Y-chromosomal lineage patterns among the five ethic groups analyzed, wherein both interconnectivity and independent microvariation were observed in parallel, albeit in a differential manner. Notably, the novel Y-STR data on Turkmens, Syriacs and Yazidis from Northern Iraq constitute the first of its kind in the literature. Data presented herein is expected to contribute to further population and forensic investigations in Northern Iraq in particular and the Near East in general. The curious part is that Syriacs and Yazidis have very high levels of R1b compared to the other sampled populations. It's moderate in Turkmen and low in Arabs with Kurds. It's quite amazing how much Baltic LBA RISE598 differs from modern Balts in that PCA. And although he's LBA, it has to be kept in mind that he dates to the first millennium BC, between 908 and 485 BC, according to calibrated C14 dates, a time when in central Europe the Iron Age was already flourishing. I wouldn't say he was a Proto-Slavic invader, though. That's far too early and at the wrong place. RISE598 was found at a place where in Medieval times the Sudovians were living, a West Baltic tribe closely related to the Old Prussians. Actually, he might rather represent the real Proto-Baltic invaders who reached the Baltic region in the Bronze Age from the South. The PCA Matt posted - https://4.bp.blogspot.com/-0X53ULQMZ6U/WfhwdhmT9zI/AAAAAAAAGNQ/zs34s9OzA00HFftgKc-s10cus_wWLAwGQCLcBGAs/s1600/WEZ_West_Eurasia.png - makes sense of the rumors I have heard about Wielbark samples. Apparently they were also of this WHG-shifted kind, and hence should be similar to Welzin_BA. "Strangely, CHG seem tall (just above 180cm) and EHG seem shorter (the same 176cm range as EEF) in their analysis, and STP are accordingly intermediate. Not necessarily what I would've been expected, but Allen's Rule may have been at play in adapting EHG to be short, sturdy and robust compared to taller and proportionately slimmer WHG / CHG or Anatolians of the same height and more generally gracile proportions, all perhaps evolving in more temperate regions. Anyway, seems like trading a bit of CHG for EEF or EHG might make some populations slightly taller than expected?" That can't be right. A recent paper had a graphic on height of Ancient groups and placed CHG as short as EEF. I can probably find it. @Romulus, Martiniano et al 2017 (http://journals.plos.org/plosgenetics/article?id=10.1371/journal.pgen.1006852). Martiniano's result was from completing imputation on samples, then used data from the GIANT study (https://www.broadinstitute.org/news/giant-study-reveals-giant-number-genes-linked-height) for markers and scores on the imputed data. This study used the same markers (Wood et al (2014) page 29.) I do not think they carried out an imputation step. We all know genetic distinctiveness forms when a collection of individuals and their descendants continuously only breed with each for many generations. Evolution supposedly usually occurs in those small-inbred populations, but can also occur in multuple barely related populations if the same trait is selected for in each population. As a genetic experiment, two brothers from a tiny tribe are split at birth. One brother remains in that village. For 30,000 years that tribe's descendants are forced, by evil geneticists, to be genetically isolated from the rest of humanity, they were only allowed to breed with each other. The evil geneticists placed the other brother into a society but not a genetically interlinked society. For 30,000 years, in this society people are only allowed to "breed" with completly unrelated humans. I know it is impossible for people in a society to remain completly unrelated for 30,000 years but let's just say somehow the geneticists found a way. How would the people in the inbred world and the non-inbred world differ genetically? The people in the non-inbred world be "less evolved", closer to the ancestral state the two brothers were in 30,000 years earlier. While, in the population that remained inbred for 30k years all kinds of new traits and new genetic distinctive markers would have formed in their DNA. Inbredness, Relatedness, whatever you want to call it is the bread and butter of geneticists right? It's the source of diversity of life? Therefore, if no inbreedness, relatedness exists then no genetic changes, no new diversity, will occur, right? Seems like you're basically confusing evolution with speciation. And by the way, inbred populations with low effective population sizes and genetic diversity are at high risk of extinction, because they can't adapt to changing pressures as well as large, genetically diverse groups. I asked that question for three reasons. One, some populations are more inbred than others and I know this has to be significant, I'm just not sure how. The second reason what does this say about the difference between the genetics of "New World" people and "Old World" people? All New WOrld people are a mixture a distinct, inbred Old WOrld populations. For example, what does this say about the difference between Dereck Jeter (New World) and a Pygmy (Old World)? Dereck Jeter must have something like x4 more ancestors than a Pygmy person. What, will human genetics look like in 10,000 years? More and more the world population keeps growing and people are migrating and "breeding" with unrelated persons, both of which prevent inbreedness. "Seems like you're basically confusing evolution with speciation." Yep, by "evolved" I guess really meant speciation. I plan on doing a genetics 101 study project so I'll learn the basics. In an inbred population everyone eventually, after so long, "evolves" to become genetically really similar and eventually a new species. What I'm wondering is since inbreedness is the driver of genetic diversity (and speciation) do indviduals from non-inbreed populations remain more in the ancestral state, don't "evolve" into a new species? Well, even so, isolated, inbred populations are unlikely to get the chance to speciate because they're at a higher risk of dying out due to their low diversity and thus inability to adapt to changes. New species do form as a result of populations becoming isolated from each other, but this doesn't need to be accompanied by high inbreeding, and as I say, generally isn't. For instance, one part of a large, genetically diverse plains population might be forced to live in the nearby forests as a result of intense competition on the plains, and over time the plains and forest groups stop breeding with each other, evolve in separate ways as they continue to adapt to their environments, and form new species. Just one example. Keep up the good work. I'll take you up on your offer. Mark Lipsons paper is on Nature. That would mean that from now om the Blatterhohle samples are available, wouldn't it? Had a look at it yet? I haven't had a look at it yet. Btw, Blatterhohle R1b is pre-R1b1a1a2-M269. Genetiker has him as pre-V88, apparently . Genetiker is run by a White Nationalist hostile to the Kurgan Hypothesis and advovate of a White presence in Mesoamerica before the Age of Exploration. Anyhow, if Blatterhohle is actually V88 instead of pre- M269, that kinda confirms the steppe hypothesis (for Northern Europe), doesn't it ? "Pastoralist Mobility in Bronze Age Landscapes of Northern Kazakhstan: 87Sr/86Sr and δ18O Analyses of Human Dentition from Bestamak and Lisakovsk"
resources at the local and regional level rather than at pan-regional scales across the steppe." 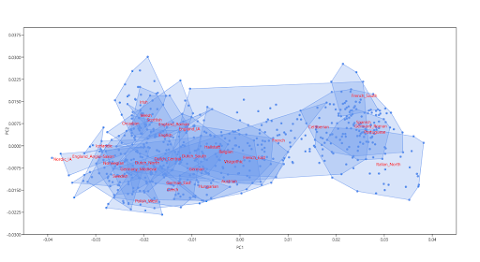 So, IIUC, they argue that populations they studied suggest that mobility was greater during the EBA Sintashta period (characterised by large, fortified settlements) than during the subsequent Andronovo phase, where smaller more dispersed settlements dominate over a much greater territorial span. I don't care if he's pre-R1b1a1a2-M269 or pre-V88 in any case genetiker is pretty reliable but I did see him post something inconsistent about I/C1a for like Paglicci I asked him but he never responded so I still don't know whos right him or the paper someone made a mistake. How did Sam get the idea he's pre-R1b1a1a2-M269?? I hope we know for a fact what he had soon however I am betting on pre-V88 per the general reliability of genetiker. The only way genetiker would be wrong is if he sequenced the wrong sample and I doubt he did that. I think 95-99% chance its v88 and only a 1-5% chance Sam knows what he's talking about but we will know soon enough 100%. On the R1b, Bell Beaker discussion thread it's an assumed fact that Bla16 is pre R1b M269. The Lipson preprint says he was derived for some M269 equivalent SNPs and negative for others. Apparently the new Mathieson et al. paper and data are coming very soon. There's a presentation coming up later this month at Human Evolution 2017 about the genetic origins of the Roopkund skeletons. Some of them show affinities to Greeks and Levant populations. The rest look basically Indian. And Nick Patterson and David Reich are co-authors of that Roopkund talk. It's interesting that many current Europe-wide subclades in K and H only appear in the Iberian Neolithic and are absent in the German and Hungarian and Barcin Neolithic. Also, how do we explain the almost complete lack of N1a1a in modern European but a high frequency of N1a1a in the German and Hungary and Barcin Neolithic? I'm working with loads of rich modern European mtDNA data. I'm running lots of scienores through tests. One scenario I'm pretty confident of is a tiny contribution from Barcin, LBK, Hungary Neolithic-type to modern Europeans. So some legends and Myths have a certain percentage of truth to them as seen at Roopkund. Without political or other manipulation some stories can be transferred intact for at least a thousand years. Very interesting. Ok! Waiting for my Family Finder results from FTDNA. I will email the raw data when I receive it. Thank you! Hello, I would like to know which one of them would help me interpret my results better because I'm really a super novice in all this topic but I would like an expert to help me. I tested myself with FTDNA origines and got my haplogroup mtDNA. The Global 25 provides a very thorough genome-wide test. You just have to get very good at using it, but that doesn't take long, maybe a week or so. Basic scientific question: Where do I click to send you a DNA sample and $12? Please use this e-mail to send me your data and the cash (via PayPal). I am keen to buy your test(s) matched against ancient DNA esp the recent finds included in the 2018 Olalde Paper & database. In particular, as to if E09568_d in any way matches my data or if E09568_d can be seriously considered as R1b-S1194 (Genetiker published a match between S1194 and E09568, but after 2 weeks of trying to get him to confirm his calls, have now given up trying to get a reply). Just need to ask which test (& $ amount) and I'll supply FTDNA F/F data (but can supply BigY or event FGC Y-Elite if that could be any help to you). I don't work with Y-chromosome data, though maybe I will soon, because I'm getting a lot of enquirers about that. In any case, it's very difficult, nay impossible, to directly match ancient pseudo-haploid samples with modern-day individuals as genetic relatives. That's because pseudo-haploid data doesn't allow for any sort of decent Identity-by-Descent (IBD) analyses. And the ancient samples in Olalde et al. are all pseudo-haploid. However, I do have some interesting tests that work very well with pseudo-haploid ancient data, and they are described at these links. The prices for these test are listed in the above blog entry (USD $6, $12 and $6, respectively). Thanks - yes will work through those tests (already can see I am interested in 1st one) - will work through the other 2 and get back. $18 sent for 1st & 2nd tests (details in paypal note). Email with 37-* F/F file also sent. All of the tests at GEDmatch are for fun and have their limits, but like the Jtest, they're also useful in varying degrees and can be taken seriously if they're used and interpreted correctly. Thanks for your answer. Still a bit confused with the 'all for fun' and limitations? does that mean that some chromosome markers for example are wrong? or all of them right? or does that mean that some are missing. sorry, I am a writer, and I have to wring out all the info! LOL! sorry to be a pain, just trying to help other guys. I do appreciate your help. I'll add 0.2c worth of thoughts - the calculators at GEDmatch and offered by citizen scientists are a welcome effort whereby we learn to value some works over others. There is no 'truth' ?. The reality is that this whole field is a rapidly shifting ground that is being reshaped by 1) rapid and dramatic advances in analysing ancient DNA, along with the rapidly growing number of aDNA finds, and 2) by the rapid advances in DNA testing with the latest great advance being NGS. The admixture calculators are 'fun' but can be taken as seriously as we wish to take them. Think about what it means for say myself, to have an admixture analysis done 2 years ago and fed through various population profiles or now ancient dna profiles. Would that data be as useful today ? (not really). Will todays data be meaningfull in 2 years time (unlikely). It is a fun area where we can hone our understandings and knowledge then apply it where we can or we want to. As far as I know, there's nothing wrong with the tests at GEDmatch, or at least those that I've used. They're correctly put together and still produce correct results. But these results must be interpreted correctly, and that means that often they can't be taken too literally. Also, when I said that they have limits I meant that there are things that they can't tell you because they don't have the power to do so. Sort of like an old home computer not having the power to do the work of a super computer. But to put it all simply, those tests are now outdated and it's high time to move on. Thanks David, I appreciate you answering. Thanks Doug, I appreciate your help. Is that price per each kit? Or two kits? Or three? And will you continue to give free "upgrades" to your newer tests? Generally the prices listed are per kit, although I can run one kit for free in the Global25 in a batch of four or more if requested. Like with the Global10, once you pay for an analysis in the Global25, then updates are free. Although I'm not planning to update the Global25 at this stage. I am a female and I am interested in knowing more about my Jewish Heritage. My Jewish roots come from my mom and my Grandfather on my Mom's side. ( My Mom's Father) Which test would be best from you and which type of test should I have done by My Heritage or other? Is autosomal right or do I need one of the specialized ones? My son had his DNA done with MyHeritageDNA Which showed 1.2% Jewish Ashkenazi descent. When I uploaded to Family Tree it shows 5% Sephardic. Your JTest showed Ashkenazi 3.49%. In the context of what I can offer, the best thing you can do is try the Global25 and get really good at using it, because it can pick up and accurately characterize Jewish ancestry if used properly. 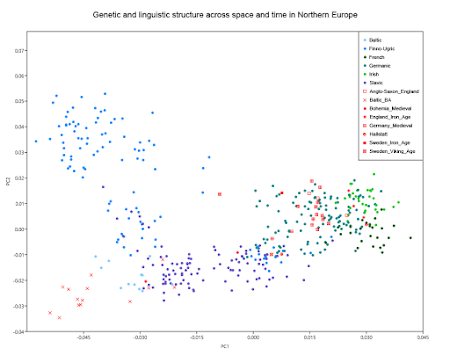 This tutorial covers ancestry modeling with ancient populations, but the concept is essentially the same when modeling with present-day populations, like Jews. And yes, you'll need to send me your autosomal raw SNP data to get started. Also, I'll be running a workshop at this blog about making the most out of the Global25 coordinates next week, on DNA Day. Thank you for your quick reply! That is very helpful. I will follow through with this. One other question for you. Do you, or do you know of anyone, who will look for the CDKN2A gene, BRCA1/BRCA2 , and The BRAF gene mutation test (mutation in V600E is found in BRAF gene)? I have been tested for the CDKN2A gene as positive. I have had melanoma 3x and it runs in my family. My children and family can get tested for this through medical but my Dr. said he isnt sure about the Insurance implications in the future that this may cause. But I thought if I could get private testing it wouldn't be an issue. Sorry, I can't help you with medical genetics. You need to see a specialist about that. "Like with the Global10, once you pay for an analysis in the Global25, then updates are free. Although I'm not planning to update the Global25 at this stage." Then you are confident that Global25 will continue to bear fruits of progress for the foreseeable future, and you don't have plans to deviate from the current trajectory? Link a paper we can read? I don't think I'll need to update the Global25 for a while, not unless it starts producing results that deviate from those obtained using formal statistics and also those seen in scientific literature. Refer also to the comments. Apart from that, all of the necessary info is on this blog. So this might be a silly question...so very new to this. I received my raw genetic file from genes for good study. I uploaded it to gedmatch. Would this be an acceptable file to send you? - Thanks. In 1654 my ancestor settled in Szczecin (he arrived from Rhineland Palatinate as a descendant of the Jews who after 1492 left Iberia/Jews Sephardians). My ancestors in Palatinate/Germany lived in the period 1495-1650 (my name has root in Yiddish and refers to the prayer tradition of Jews from Palatinate, which Jewish refugees from Spain took over after 1492), and in Pomerania/Neumark in the 1650- 1795 and in five generations they traveled to Wielkopolska/Greater Poland (the German period is divided into two sub-periods: 1492-1630/Jewish diaspora, 1630-1795/protestant community/since 1654, theoretically, in this family the Saxon admixture/wife, and from 1795 r admixture of women's lineages from the territory of Poland/Greater Poland, from 1941 admixture of the female line mtDNA I1a1 originating from Podolia/I RP/II RP/now: Ukraina). The ancestors of the migrant from Palatinate came to Spain/Iberia around 680 AD from north Africa/Morocco, which traveled between 100-680 AD leaving Judea after 70 AD (my great-great ancestor post-Mitanni/post-Huryta/a neo-Assyrian probably came to the family of Judahites/he married with woman of Israeli - around 560 BC, when the Jews were deported to Babylon). I conducted genetic tests in Poland (CM UMK) and GB (LivingDNA). - J-M67/about 225 SNPs + autosomal; research in Britain. If it is possible, I want to learn more about my Jewish origin based on the GLOBAL25 analysis (in my opinion, probably, the "Israeli marker" in my male family was around 2200 years/560 BC-1654; sources of origin must be sought in the vicinity of the southern coast of the Caspian Sea/Iran/Zagros, and later for 150 years of admixtures in autosomes from the German/female area, and in 1795-2018 admixtures in autosomes from the area of Poland/perhaps the key to my autosome design it has admixture from 1941/my mom/Podole/I RP, II RP/now: Ukraina - I1a1, whose ancestors may have entered northern Europe (e.g. Lithuania/Balto-Slavs with R1a rhodium around 2800-2500 BC). Which test from you would be the best for me, or maybe some other kind of test should I do for the perpetuation (determination) of my genetic heritage? do I need other specialized tests? How can I send you to np. SNPs?/auDNA/autosomes? How do I pay you $ 12 for this analysis/study Global25? I'm an age guy and I'm not so proficient in these inernet transfers. I am asking for directions and advice. I would like to buy this test but I am not sure what to do or where can I pay? I have tested with MyHeritage DNA, I hope that's compatible with test! MyHeritage datasets are compatible with my tests. To order a test e-mail me at eurogenesblog at gmail dot com and send the money to the same e-mail address via PayPal. Obviously you need to change the at to @ and the dot to .